Everybody has a gimmick. McDonalds has Ronald McDonalds, Happy Meals, and play grounds for the kids. Jack-in-the-Box has the big domed dufus. His TV corporate meetings are supposed to inspire us to forgo our favorite beef eating establishments and elbow up to his table with one of his cheeseburgers in hand. Joe Sixpack, Karen Store Clerk and their seven screaming brats might be convinced, but it takes much more than Jack's overstuffed plastic face to persuade these two worldly connoisseurs of culinary delights. We have seen every slight of hand and chef wizardry use by these sly cooks to pull us away from our predestine journey. The food and not the inane advertisements or deformed front-men are the focus of these reviews. Good try Jack, but let's take a look at your food. The burger hiding inside the standard Wonder-type sesame bun, must have been old and freezer burned. Though it was fried, it had a flavor unknown and very difficult to describe. After spending hours searching through the thesaurus and Merck Manual, the only adjective that can adequately describe that flat piece of meat is brown. Yes, it tasted brown, with a bit of green. The only saving grace to that patty was the condiments. Old Jack dug deep into his corporate cook book and pulled out the tarter sauce and catsup to cover up the toxic taste emanating from that south of the floppy headed boarder meat-like-puck. Slap on a couple of tomato slices, a pickle or two, some iceberg leaf lettuce, and a slice of processed American cheese, and bingo; nobody can taste the burger. The fries were the typical frozen variety, but a bit crispier and most. They were hot and salty. It had no potato flavor and reminded me of eating Pringles that had been left in the car on a hot August afternoon. 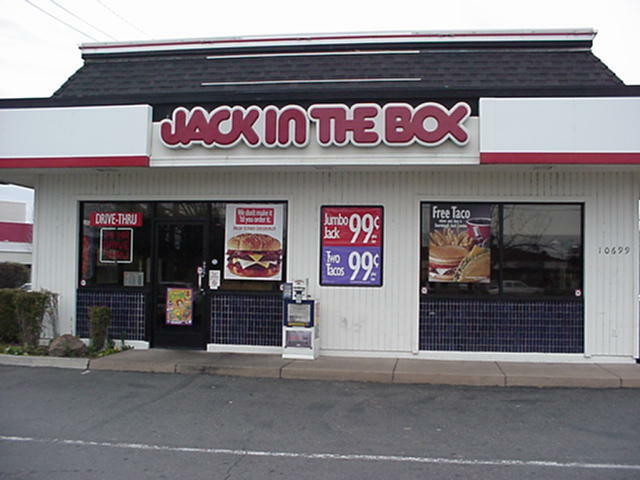 At Jack in the Box I could not wait to sink my dentures into a Jumbo Jack with cheese, because of their advertising alone makes my mouth water. It was a pretty clean restaurant, but the parking lot leaves much to be desired. The designer of this lot, in an effort to trap drive through patrons who change their minds, inadvertently designed a mini-Monte Carlo. Serve yourself soft drinks are always a plus for this writer and this store had an easy access fountain. The service here was a skoash slow for a burger with fries, but the fries were almost worth the wait. At first the tasted crispy and hot, then as the temp cooled down I closed my eyes and thought I was eating Pic-Nic brand shoestring potatoes. The burger was rated 46/100 mainly due to its patty. It had an old meat smell with hints of shoe. Fortunately there was a tangy sauce that hid a lot of the meat taste.